Following successful dates across the UK and in Luxembourg, our acclaimed festival of hip hop dance theatre Breakin’ Convention continued its 2017 international tour by touching down in Canada for the first time at the end of June. The festival attracted huge crowds to the Sony Centre for the Performing Arts in Toronto, with UK, international and local acts performing over two days and engaging audiences in taster classes and in-depth workshops. To help nurture local talent, our Breakin’ Convention team had been to Toronto in 2014 and 2016 to deliver Open Art Surgery, a one-week project offering hip hop dance theatre artists the opportunity to develop and experiment with new ideas, share new work publicly and receive mentorship from established artists. Among the talent that took part were local crews The Surgeons and Tense Image, who performed on the main stage at the festival alongside other acts from across Canada like Tentacle Tribe, RoyaLazyness and LockUnity. BirdGang Dance Company represented British talent with challenging piece Vice, while Soweto Skeleton Movers introduced audiences to South Africa’s high-energy, quick-stepping dance style Pantsula and South Korea’s Just Dance blended bboy choreography with elements of Korean culture. Many of the acts received standing ovations on both nights. Park Jam, a free family-friendly dance, live music and graffiti art extravaganza rounded off the weekend with jazz, hip hop and spoken word from local acts and Breakin’ Convention Artistic Director Jonzi D. The Famous Spiegeltent hosted Freestyle Funk Forum, hip hop’s answer to classic improvisational comedy show ‘Whose Line Is It Anyway?’. 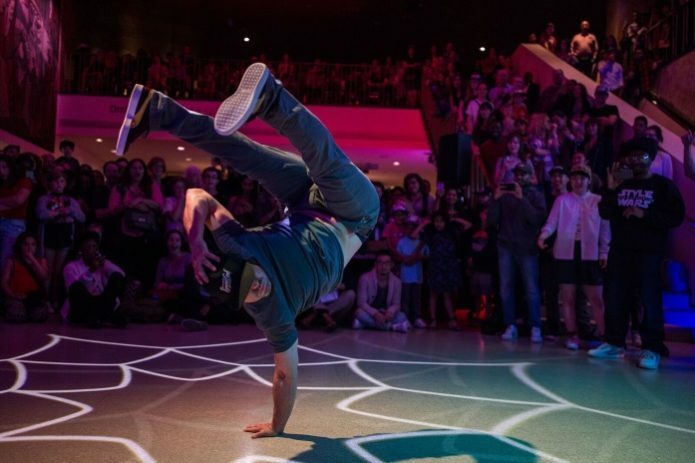 Around 4000 people attended the festival – the largest audience Breakin’ Convention has ever had. The next stop of the festival’s international tour will be a return to the USA in October, visiting Charlotte, Denver, Harlem and Miami. For more information on Breakin’ Convention and upcoming touring dates, visit the website.